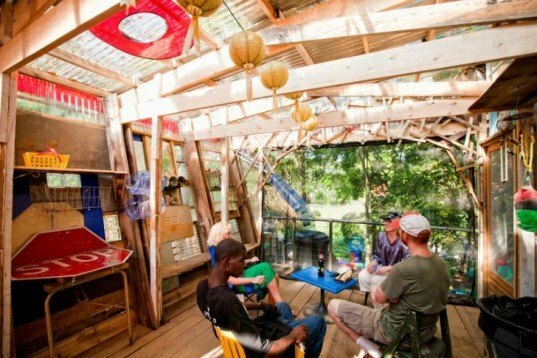 This interactive learning pavilion made from discarded objects found on-site was built during a 10 week design-build course this last summer in Asheville, North Carolina. Students from three regional universities (North Carolina State, Appalachian State and Virginia Tech) worked in conjunction with the Asheville Design Center to build the pavilion for the Peace Gardens. The pavilion utilizes solar passive design and rainwater harvesting, and it is currently used by the community for education programs and workshops. 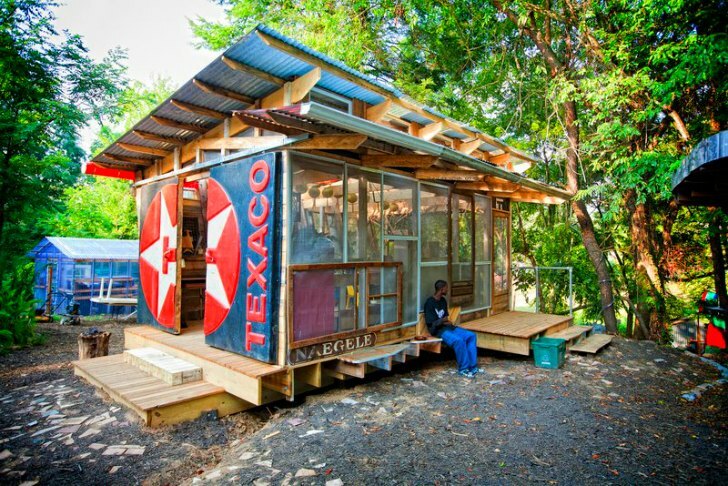 Giant Texaco signs, ironing boards, windows, screens and other found objects decorate the artistic and functional shed, which cost less than $4,000 to build. The Peace Gardens were started by local couple who set out to clean up the area and provide a space where youth could learn about environmental and social justice through hands-on experience. The area was already an eclectic space filled with art created from discarded junk and found objects. While a few pavilions and sheds sit in the gardens, the Asheville Design Center, who has been helping the community with master planning, thought an education pavilion would be of benefit. The design group brought on teams from North Carolina State, Appalachian State, and Virginia Tech with architecture, landscape architecture and construction management degrees to help design and build it over the summer as part of a design-build course. The pavilion makes use of a solid and sturdy frame that was designed and engineered beforehand, but the rest of the design came about based on materials that were found as the project evolved. The skin of the structure is different on all four sides and is defined by the site conditions. The north and west sides were designed for privacy and made from discarded wood, metal, windows and a giant Texaco sign that slides open to serve as a door. The south and east sides are made from windows and screens and are more open to take in light and connect to the garden. Rainwater is harvested from the shed roof and then diverted using a make-shift gutter made from an old vinyl sign. Water is collected in a cistern for use in the vegetable garden or to power the slide, which was built from an old McDonald’s playground. Inside, work stations are created using old ironing boards and street signs. The building is exclusively lit by natural light, which filters in through the windows and translucent roof. The space is aptly titled “Mystic Dreams” based on one of the signs the team found, and the entire structure only cost $3,900. The Peace Gardens were started by local couple who set out to clean up the area and provide a space where youth could learn about environmental and social justice through hands-on experience. The area was already an eclectic space filled with art created from discarded junk and found objects. While a few pavilions and sheds sit in the gardens, the Asheville Design Center, who has been helping the community with master planning, thought an education pavilion would be of benefit. The design group brought on teams from North Carolina State, Appalachian State, and Virginia Tech with architecture, landscape architecture and construction management degrees to help design and build it over the summer as part of a design-build course. The pavilion makes use of a solid and sturdy frame that was designed and engineered beforehand, but the rest of the design came about based on what materials were found as the project evolved. The skin of the structure is different on all four sides and is defined by the site conditions. The north and west sides were designed for privacy and made from discarded wood, metal, windows and a giant Texaco sign that slides open to serve as a door. The south and east sides are made from windows and screens and are more open to take in light and connect to the garden. Rainwater is harvested off the shed roof and then diverted using a make-shift gutter made from an old vinyl sign. Water is collected in a cistern for use in the vegetable garden or to power the slide, which was built from an old McDonald's playground. Inside, work stations are created using old ironing boards and street signs. Natural light through the windows and translucent roof is used exclusively. The space is aptly titled "Mystic Dreams" based on one of the signs the team found and in total, the entire structure only cost $3,900. Construction of the shed made use of traditional framing techniques. The rest of the materials were found on site.